Citing increasing liver disease, breast cancer and obesity, the British Health Ministry revealed plans for an advertising campaign - warning against big glasses of wine. Those big ole' glasses of wine aren't doing you any good – that's the message delivered in a 10 million pound advertising campaign to be launched across the UK this spring. The ads, targeting women between the ages of 30-50, will focus on the health risks associated with heavy drinking, such as liver disease, obesity and breast cancer; and hope to educate women drinkers about the real alcohol content in a large glass of wine. 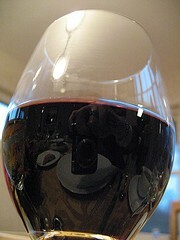 British Public Health Minister, Dawn Primarolo explains that while a lot of women believe that single glass of wine contains 1 unit of alcohol, "with the increased strength of wine and large size of glasses these days, it could be anything from one and a half units up to three and a half units, if it's a large glass of Rioja." Primola says that although the ads target women, the ministry hopes to change perceptions across society about acceptable drunkenness. The campaign launch report coincides with police reports that show a dramatic increase in late night crime since pub-closing hours were relaxed, allowing for 24 hour opening in some locations. Health officials won’t reveal the content of the ads, but promise a tone as stark as is needed. Britain has struggled with an increasing culture of binge drinking and the resultant social disorder, and past Labor Health Secretaries, Patricia Hewitt, and Frank Dobson, said that the time had come to raise alcohol taxes. Hewitt said, "Alcohol in real terms is a great deal cheaper than it was 20 years ago and when young people have so much more money to spend, there's no doubt it is a contributing factor." The ministry aims to reduce alcohol related hospital visits over the next year.